The orbiting Kepler telescope is all about the numbers. How many stars have planets? How many have multiple planets? What sizes do they come in? How many of these planets are about the same size as Earth, and how many of those are in orbits that could permit life to exist? Kepler will answer all of these questions and more. But while numbers are the bread and butter of science, they're more like medicine for most of us  and realizing that, Daniel Fabrycky decided to create some visual effects for a Kepler press release several months ago. 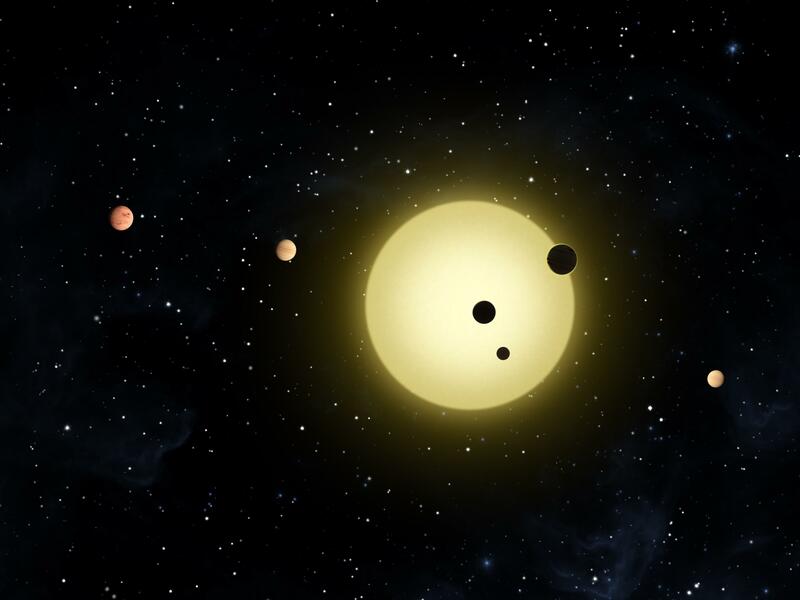 Fabrycky, a postdoctoral fellow in astronomy at the University of California, Santa Cruz, was part of a team writing up a paper on Kepler 11, a six-planet system that was announced with great fanfare this past February. "Someone had figured out that three of those planets would cross in front of the star at the same time," he says, "and I wanted to figure out where the other three were." So he wrote up a program that would plot the planets' positions as though you were looking down on the system from above (in fact, the system is edge on to Earth, which is why we can detect the crossings). To move the system forward in time, you'd press the F key. 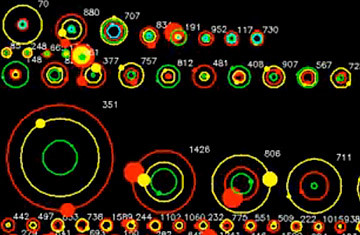 Fabrycky's plotting routine allowed artists to create a dramatic image of the system. But when Fabrycky's 6-year-old son and 4-year-old daughter sat down at his computer, they discovered something he hadn't thought of. "If you pressed the F key over and over, quickly, it became an animation. The kids were captivated, and I thought, 'This is interesting. Maybe I could put it on my Web page so other kids could play with it.'" Then he realized that the Kepler probe hadn't found just this one multiple-planet system: it had found nearly 200. So why not animate them all? The result is what Fabrycky calls the Kepler Orrery in a tribute to the intricate and beautiful clockwork models of the solar system that were popular in the 1700s. It shows any star Kepler has found (so far) that has at least two planets whirling around it. The two-planet systems are at the bottom, three-planet systems above them, and so on until the top row shows Kepler 11 alone. The planets' sizes are indicated by color, with red representing the biggest ones and cooler colors representing progressively smaller ones. Orbital periods are sped up  otherwise the animation would take weeks to cycle through  but their relative speeds are accurate. So are their relative distances from their stars. The whole thing, admits Fabrycky, "makes quite a visual impression. The magnitude of what Kepler has found doesn't really hit you when you look at a table of numbers. When you see the planets flying around, it really affects you." But it gets even better. When Fabrycky uploaded the animation to YouTube, he was offered the option of adding a sound track. He found something perfect. "These planets are buzzing around, some very quickly," he says. For fans of the classical composer Nikolai Rimsky-Korsakov, the piece needs no introduction. The video is here and also here. See how astronomers hunt for new planets.